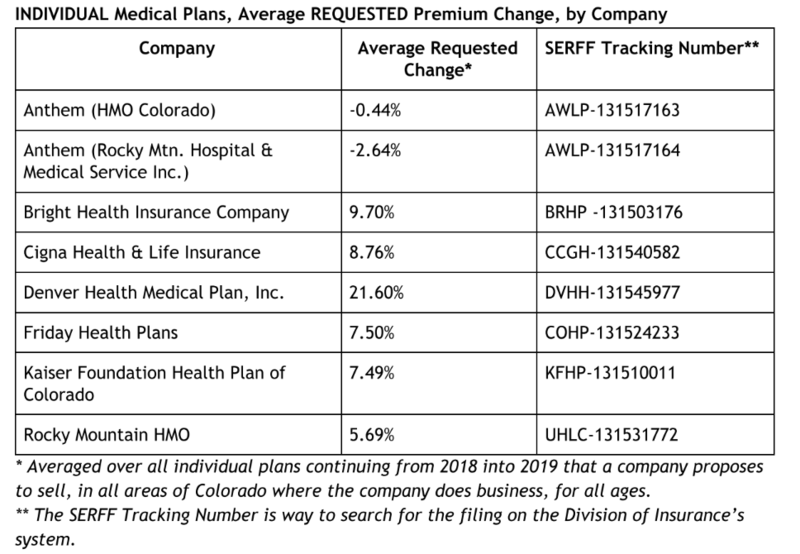 August 1st, 2018 – Last week the Colorado Division of Insurance released the preliminary rate filings for proposed health insurance plans for both individual and small group health insurance plans. 2019 looks remarkably stable, compared to the bumpy road we’ve traveled since the advent of the Affordable Care Act. Anthem, Bight Health, CIGNA, Denver Health, Friday Health and Kaiser will all be returning to offer health insurance plans again in 2019. The average rate increase in 2019 is just 5.94% for individual plans and 7.15% for small group plans. This is a welcome change from the painful double digit rate increases of prior years. Bronze plans in Colorado are increasing an average of just 0.9%, Silver plans are increasing an average of 12.3%, Catastrophic plans are increasing an average of 5.17% and Gold plans are increasing an average of 6.85% in 2019. Below are the average rate increases, by health insurance carrier. The final approved plans and rates are to be formalized by the Colorado Division of Insurance in late summer. Open enrollment for the 2019 plans will begin on November 1st, 2018.